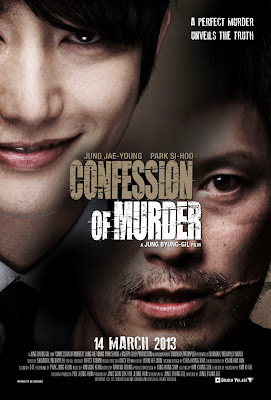 Thanks to Golden Village and omy.sg, once again I get to watch the movie preview~ This round, of the Korean action thriller, Confession of Murder. Just as everything is at the hype… there’s a twist that suddenly caught you unaware and… force you to let go and feel relax… As I was watching the way the girls inside the movie gone mad about the handsome murder, and tried so hard to ‘prove his crime’, I can’t help but feel a bit sad towards this. Although this is just a show but I know in reality, more and more people are idolizing ‘criminal act’ in the wrong way… is it just me thinking too much or is the script writer trying to be sarcastic towards these people? Certain portion of the show is quite violence, guess that’s why the show earn a rating of NC16, somehow I can’t help but feel that the director has done a freaking awesome job in playing around with our emotions. This is the trailer, looks interesting, isn’t it? An infamous serial killing case left 10 women dead shook the nation. In Korea, the statute of limitations last only 15 years. 2 years after the statute of limitations is expired, a man named Lee Du-seok publishes a book titled “Confession of Murder”, claiming his responsibility for the murders that took place 17 years ago. His book becomes a huge success, making him an instant celebrity thanks to his beautiful façade and innately danger that’s associated with his presence. Choi can only watch from the sidelines as his hands are tied, because Lee has been pardoned legally. This story actually referenced from a real life case of the infamous Hwasung serial killer. Between September 15, 1986 and April 3, 1991, 10 women were bound, raped and killed in the city of Hwasung. This case is never solved and its statute of limitations has expired.